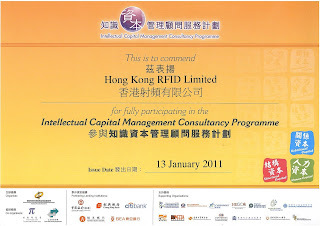 Hong Kong RFID Ltd is proudly awarded as an outstanding participant of the Intellectual Capital Management Consultancy Programme jointly lauched by the Intellectual Property Department (IPD), the Innovation and Technology Commission and the Trade and Industry Department. The programme was created to help enterprises gain a better understanding of Intellectual Capital Management and utilize a set of management tools to maximize their business potential. With the aid of training materials and consultancy services from the supporting parties, key intellectual capital were identified in the intellectual capital report written upon completion of the programme. The main drivers behind our company's success, which include our human, structural and relational capital, are elaborated in details in the report. It allows stakeholders to have a better understanding of our capibility and future potential. 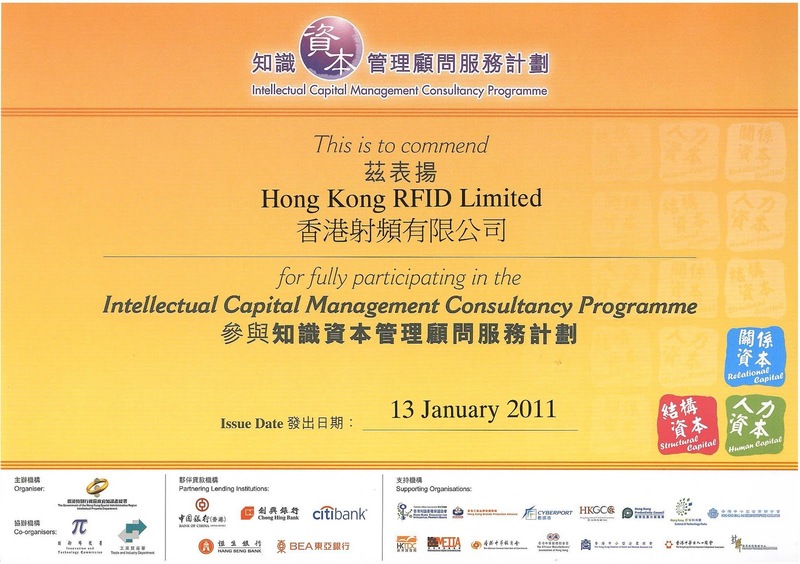 According to IPD, Hong Kong RFID is the first company in the information technology industry to publish an intellectual capital report. As a pioneer in this campaign, our company's effort has been recognized by a certificate awarded by the organizers. It is hoped that more companies will follow our footsteps and pursue intellectual capital management. In the future, we will continue to commit in the advancement of the industry.